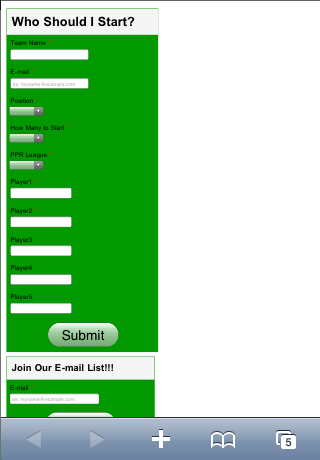 viewing form on iPhone makes form longer and stretched how do i fix the with iWeb? when i view my form on my iphone it is all out of sorts and looks horrible can you please fix this for me i am using iweb what is the easy fix thanks! It looked fine on my iPhone browser. It looked fine. Please see the screenshot below. Do you see something different? it doesnt look fine! go look at the same forum on a regular computer or ipad it is much shorty and compact and looks way better but because the iphone stretches it i have to arrange my whole websit ei need to be able for it to look the same. the iphone puts the words above the feild insead of behind it! Sorry, I guess I am too used to seeing things different on iphone. We will work on the differences. Thanks. By the way, the differences are intentional. We made it that way so that forms are more usable on small screen. You can zoom on the form and fill it much more easily i. Iphone this way.